The Survival Basics - the name says it all! This kit has emerged as a favorite for gift-giving or as an employee safety award. 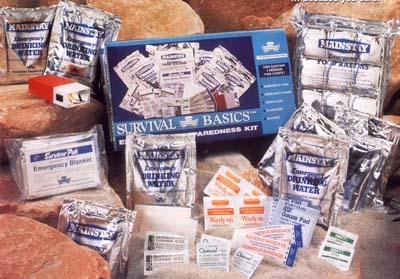 Complete with food, water, blanket, flashlight, and medical supplies, the Survival Basics is a true emergency response unit. It's small enough to fit in a locker, and sturdy enough to last well beyond its shelf life of five years. This kit can sustain one person for three days, and although it only takes up a small space, it will make a large impact on your safety and state of mind!